A sirloin pork chop has less fat than a skinless chicken thigh so it's a healthy choice for dinner. Sirloin chops, sometimes called blade pork chops, aren't quite as tender as a center cut pork chop. The farther from the center of the pig to the back -- where the sirloin is located -- the meat is less tender, bonier and fattier. Braise the meat so it becomes tender and stays juicy. 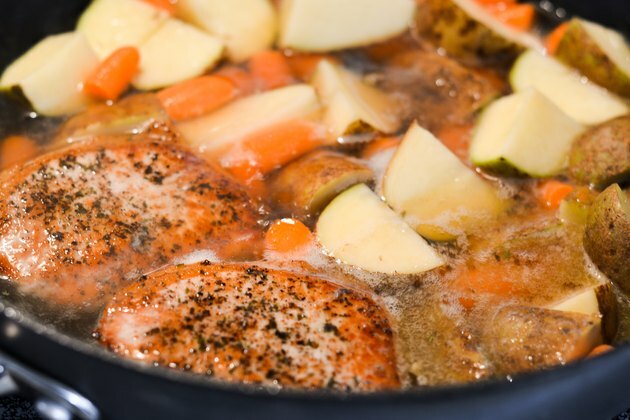 Cook vegetables at the same time as the pork chop for a one pot dinner. The vegetables add fiber and vitamins as well as lots of flavor. 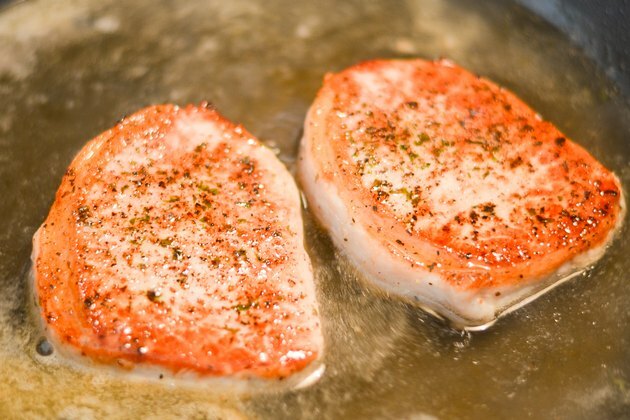 Use the juices in the pan as a base for a sauce to top off that pork chop. Remove the fat around the pork chop. Add the fat to a skillet set on medium-high heat. 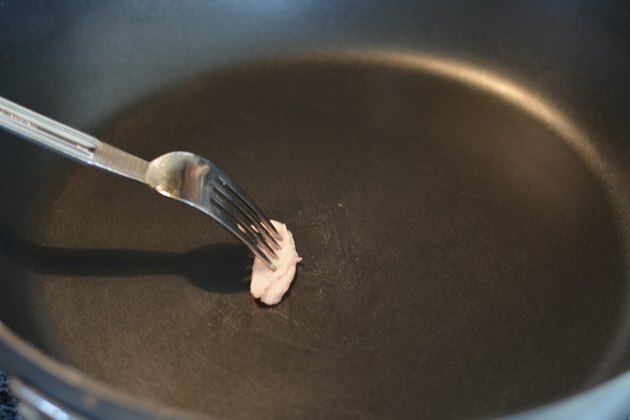 Pierce the fat with a fork and mop the bottom of the pan until it glistens with pork fat. This way you don't have to add any oil to the pan. Take the fat out. Season each side of the pork chop. Use herbs and spices so you don't have to add much salt. Choose from thyme, sage or rosemary. Caraway or mustard seeds are other choices with pork. Place the sirloin pork chops into the frying pan so they're not touching. Sear until each side is golden brown, probably no more than 3 minutes a side. Brown the pork chops in batches, if necessary. Add a cooking liquid to the pan. You have your choice of wine or beer, vegetable broth or fruit juices. The liquid should come halfway up the sides of the pork chop. 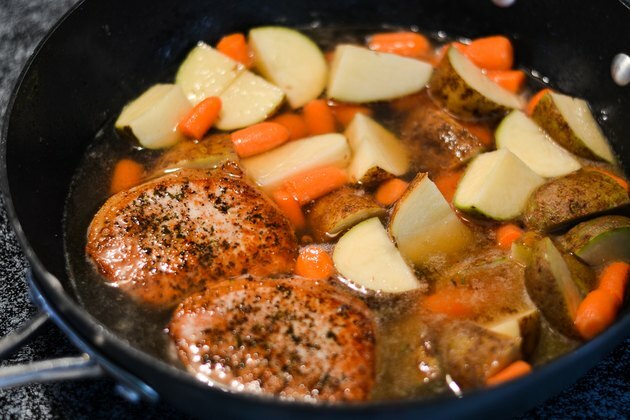 Exactly how much liquid to add depends on the size of the pan and the thickness of the chops. 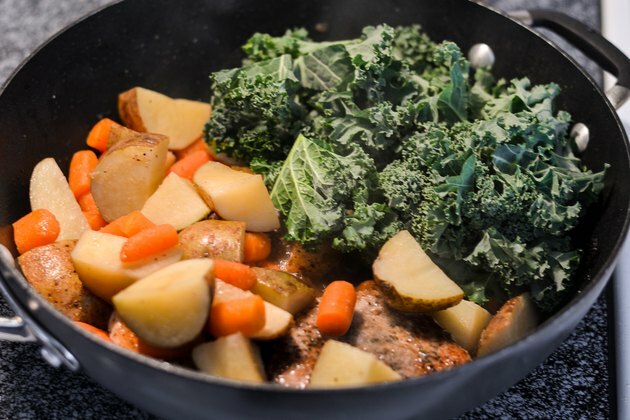 If you're adding the vegetables you'll need a larger pan than if you're just cooking the chops. Add vegetables such as potatoes, yams, parsnips, carrots or rutabagas. Choose vegetables that will cook in about 30 minutes but not become mushy. Bring to a boil. 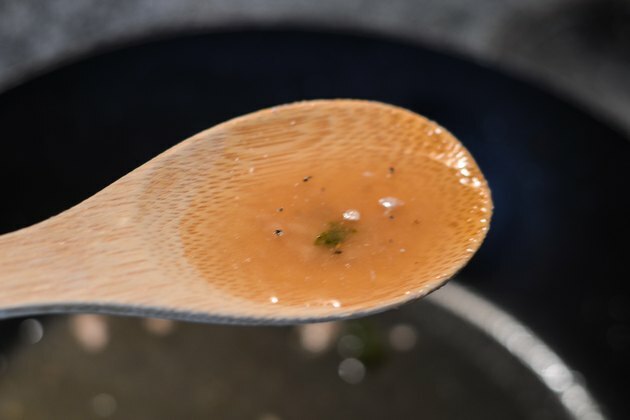 Reduce the heat to a simmer -- bubbles break the surface of the liquid. Cook 30 minutes. Julienne some greens such as cabbage, kale, spinach or mustard greens. Push the pork and vegetables over too one side of the pan and add the greens during the last 15 minutes of cooking. Remove the sirloin pork chops and vegetables. Taste the liquid in the pan. If it needs more flavor, add additional seasonings and reduce it by increasing the heat and boiling off some of the water. 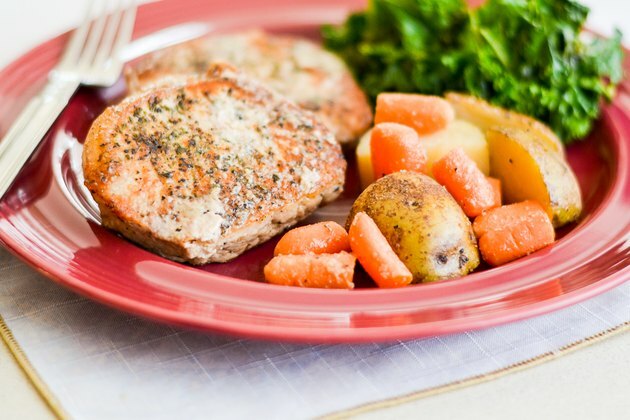 Use your slow cooker to cook the chops while you go to work or attend to other chores. Brown in a skillet. Add the vegetables, but not the greens, along with the pork to the slow cooker. Add the liquid to the skillet and scrape up any brown pits. Put enough liquid in the slow cooker to almost cover the vegetables and pork. 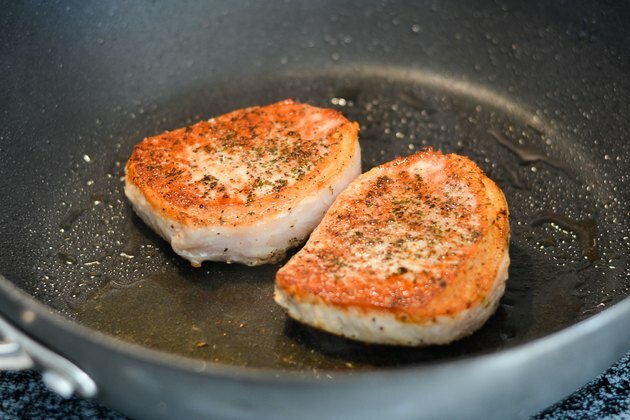 If the saute pan is oven proof, bake the pork chops in the oven for 45 minutes at 350 degrees Fahrenheit. 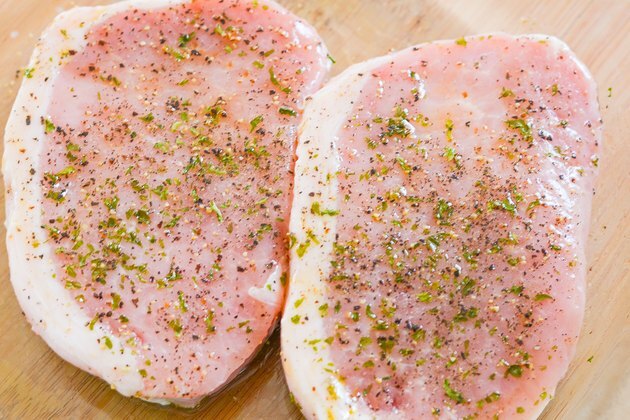 Pork sirloin chops must be cooked to 145 F according to FoodSafety.gov. Insert a meat thermometer into the flesh of the chop. Sirloin pork chops don't work well when cooked quickly on the grill. If you grill them, cook over indirect heat on a low fire -- you can hold your hand 5 inches above the grate for 5 seconds before it becomes to hot and you have to remove your hand. Place a pan of water underneath the grill grate below the pork chops.